onion-tomato base. 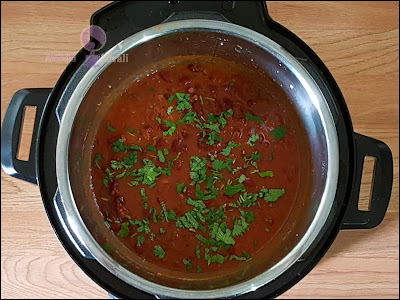 Kidney beans curry is basically made using raw kidney beans which are soaked and then cooked with onions, tomatoes and with some Indian spices called. 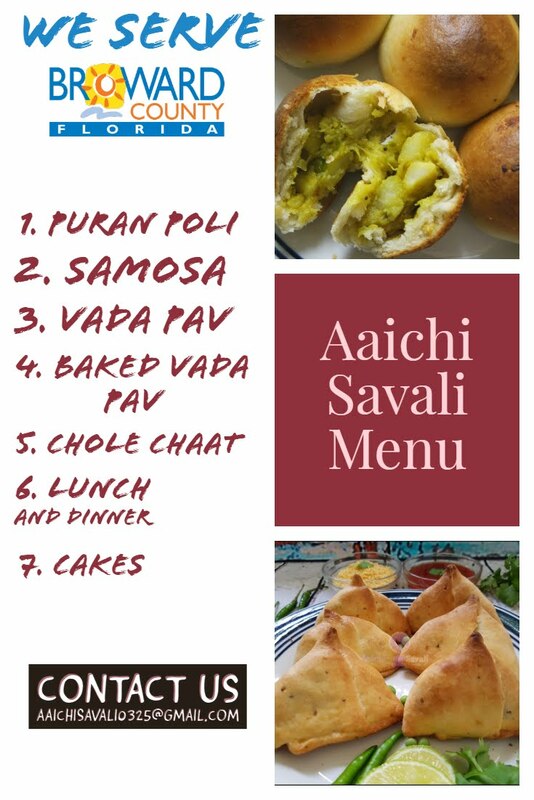 It tastes good when you eat it with plain or jeera rice, roti, chapati or naan. Beans make an excellent source of protein for vegetarians and vegans. They are lower in calories and higher in dietary fibers. 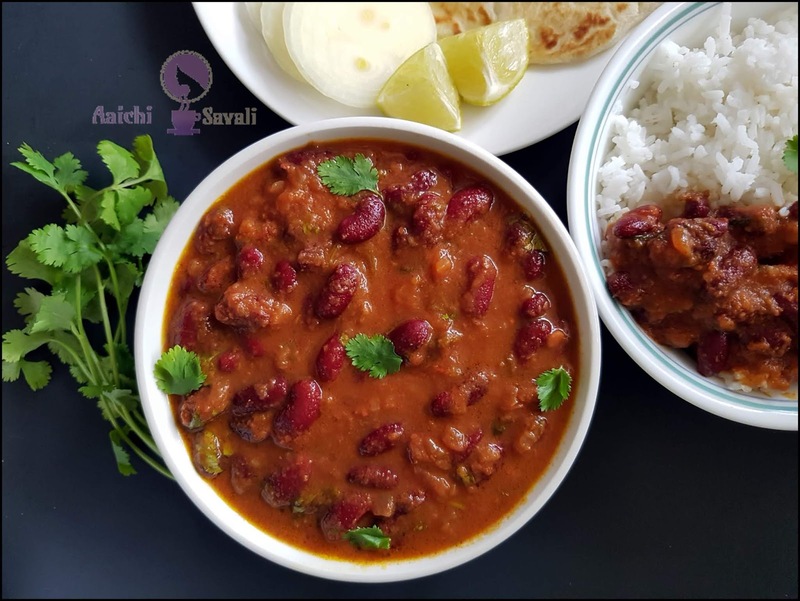 These Kidney shaped beans are good in simmered dishes where they absorb the flavors of seasonings and the other ingredients with which they are cooked. When combined with whole grains such as rice, kidney beans provide virtually fat-free high-quality protein. Preparation Time: 10 Minutes; Cooking Time: 16 Minutes. Each serving of red kidney beans curry contains 150 calories. 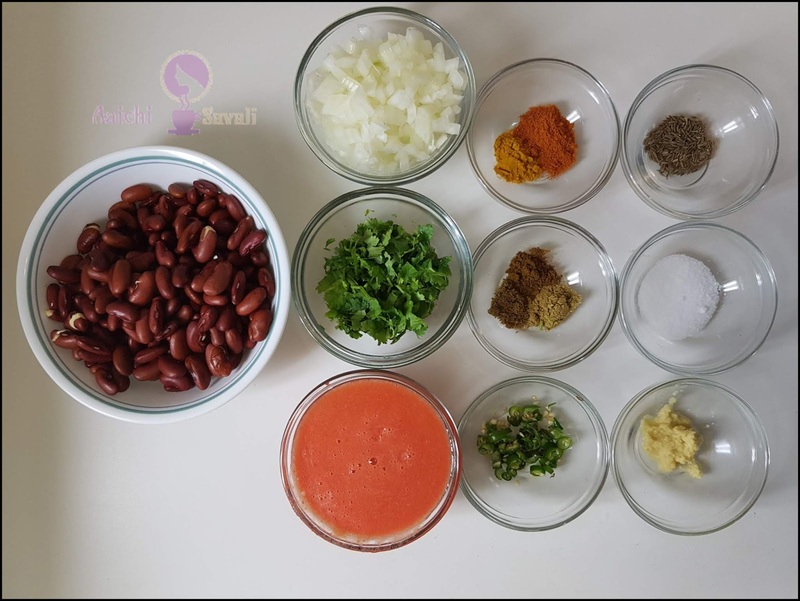 Wash and soak rajma for overnight or 8 to 10 hours in the water. Turn on sauté mode of instant pot and heat olive oil and splutter cumin seeds and saute green chilies. Now, add chopped onion and ginger-garlic paste and cook for a minute and add tomato puree and mix well. Now add coriander powder, cumin powder, garam masala, turmeric powder, red chili powder, salt and half of the coriander leaves and mix all well. 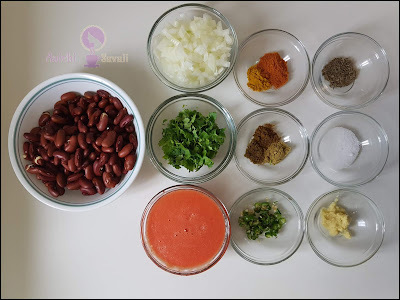 Lastly, add rajma and ½ cup of water and mix all well. Garnish with remaining coriander leaves and rajma is ready to serve. Enjoy!!! You may replace olive oil by adding ghee/butter/coconut oil. While cooking kidney beans, instead of water, you may add milk 1 cup. It makes 4 servings.. Based on a 2000 calorie diet. Per serving contains 150 calories, along with carbohydrates - 16.76 g, dietary fibers - 5 g, fat - 7.4 g and proteins - 5 g.
Beans make an excellent source of protein for vegetarians and vegans. Beans are also lower in calories and saturated fat than some other protein sources, such as dairy products. Dietary fiber: Kidney beans are rich in soluble and insoluble fiber. It helps to increase stool bulk and prevent constipation, also helps prevent digestive disorders like irritable bowel syndrome. Fibers present in kidney beans, which moderate blood sugar levels and promote colon health. Kidney beans are a good source of vitamins and minerals, such as molybdenum, folate, iron, copper, manganese, potassium, Vit. K and phosphorus. Being low glycemic index, eating kidney beans are may also improve blood sugar control in people who are diabetic. Good Time to Eat:It is good to eat kidney beans curry for lunch as well as for dinner.